Kate opted for another dress by Saloni London for this evening's pre-tour reception at Kensington Palace. William and Kate hosted the event in the public portion of the Palace. The Duke and Duchess met young people from Bhutan and India in advance of their visits to those countries. Some of the guests were Indian entrepreneurs supported by the UK's Trade and Investment Global Entrepreneur Programme. The Duchess of Cambridge attends a reception at Kensington Palace in London during which they met young people from India and Bhutan living, studying or working in the UK, ahead of her and her husband, the Duke of Cambridge, tour to India and Bhutan. The Duke and Duchess of Cambridge attend a reception at Kensington Palace in London ahead of their tour to India and Bhutan, during which they met young people from India and Bhutan living, studying or working in the UK. The Duke (centre left) and Duchess of Cambridge (centre right) attend a reception at Kensington Palace in London ahead of their tour to India and Bhutan, during which they met young people from India and Bhutan living, studying or working in the UK. Tonight's function gave the Duke and Duchess an opportunity to learn first-hand about the places they will be visiting, getting a sense of contemporary culture in both countries. Many of those attending the event were students. Below, William is seen speaking with Chevening scholarship students; that program works to develop future leaders by offering scholarships and fellowships to study in the UK. 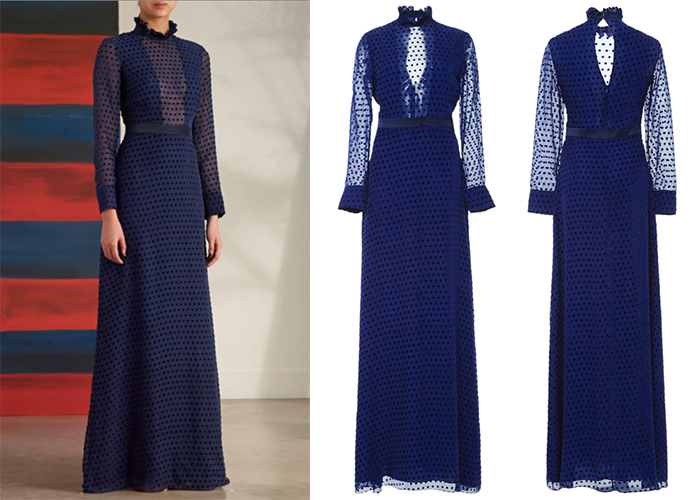 Moving to what Kate wore, we show the Saloni Mary Illusion Dot Dress in navy blue. The floor-length frock is a rayon/silk blend featuring a high ruffled neck, full-length sheer sleeves, a sheer/illusion plunging neckline incorporated into the front bodice, an exaggerated keyhole opening on the back above the hidden zipper, and a satin (I think) sash-style belt. Saloni was founded by Indian-born Saloni Lodha; we expected to see Kate wearing a new dress or two from this designer on the tour. She first Saloni for a Fostering Network engagement in November of last year, opting for the brand's Martine dress. In addition to its own ecommerce site Saloni is carried at Matches Fashion and Net a Porter; there is also a small selection of pieces at The Outnet, the discount arm for Net-a-Porter. Below we show a few current-season pieces, the Molly Silk Shirtdress is on the left ($595) and the Jess Textured Crepe Dress ($595). Kate accessorized with her Cassandra Goad Temple of Heaven earrings, and wore her Rupert Sanderson Malory heels. Tour Updates, Giveaway Winner & Another Gala on Kate's Calendar? Kate Stuns in ITV's "Our Queen at Ninety"